“Shaping the American Interior: Structures, Contexts and Practices” by Paula Lupkin and Penny Sparke, eds. In the introduction to the new edited collection Shaping the American Interior: Structure, Contexts, and Practices, Paula Lupkin and Penny Sparke declare that “the history of interior design practice in the United States is still in its infancy, a neglected stepchild amongst related disciplines like architecture and industrial design.” They note, however, that things are beginning to change, as scholars approach the design of the interior “as a collaborative modern enterprise comprising art, design, manufacture, commerce, and identity construction.” In previous blog posts, Imogen Hart commented upon the challenges and rewards of considering the interior, especially in the classroom, while Hollis Clayson noted the ways in which the domestic interior can be complicated by the uncomfortable and the uncanny. 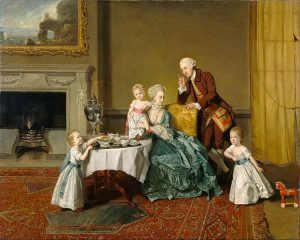 Lupkin and Sparke’s mixed metaphor of infancy and family estrangement led me to consider whether or not we might say the same for the history of interior design in Britain. What questions are raised by current scholarship? The historian Jane Hamlett, for one, would concur with the theme of neglect. 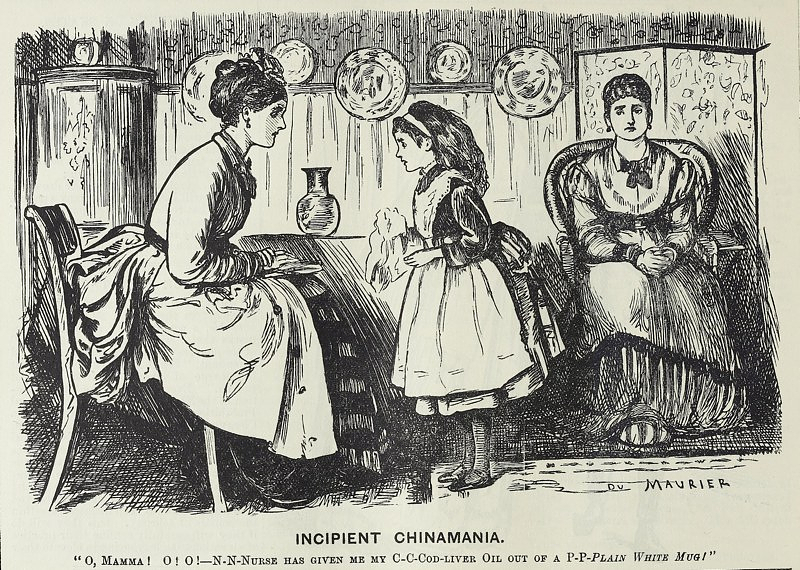 In a review essay entitled “The British Domestic Interior and Social and Cultural History” for Cultural and Social History in 2009, she notes that “for much of the twentieth century, the domestic interior has been on the sidelines of social and cultural history.” She cites the year 2000 as a watershed, marking a shift in attitudes towards the modern history of consumption and a rejuvenated debate over the spheres of “public” and “private” in historical terms, notable for the establishment of the Centre for the Study of the Domestic Interior, a joint venture between the V&A, the Royal College of Art and Design, and Royal Holloway. 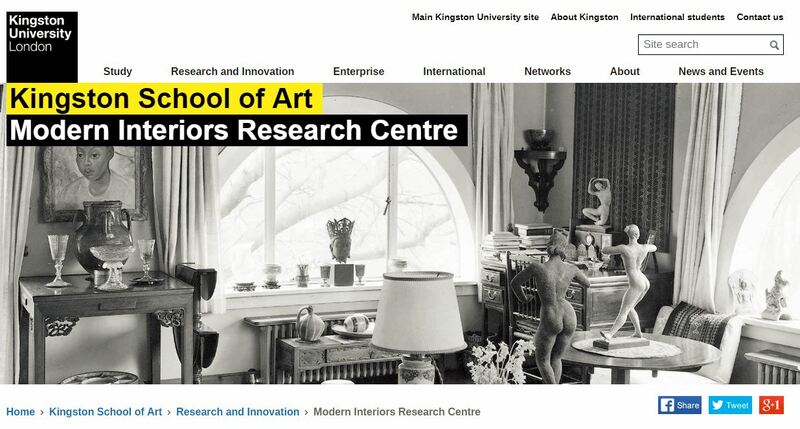 (the Modern Interiors Research Centre began in 2005 at Kingston University). Hamlett goes on to consider key strands of scholarship that address three important areas: space, especially in relation to social practice, the social role of objects, and the study of consumption. 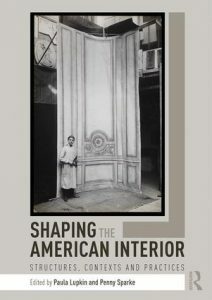 * While “space” charts interdisciplinary terrain with architectural history (a major concern of Shaping the American Interior), the central place of objects marks an affinity with material culture studies, and her essay includes a renewed call for historians to attend to material objects. Also in 2009, Routledge published History and Material Culture: A Student’s Guide to Approaching Alternative Sources, edited by Karen Harvey. In her introduction, Harvey notes that “material culture is one important key to unlocking the everyday lives of people, balancing social and cultural contexts with the physical facts of things; and it can free historians to recast historical narratives, sometimes challenging historical orthodoxy.” The range of topics and disciplinary approaches in the volume–from textiles in the Atlantic World c. 1500 to material culture and modernity in China–suggest the richness and diversity of this approach. Johann Zoffany, “John, Fourteenth Lord Willoughby de Broke, and His Family,” about 1766, Getty. This turn towards Interiority raises key questions that need further exploration: one, how do we recover the “intimacy and affect” of the past, and, two, whose interiority are we seeking to recover? Retford’s argument hinges upon the representation of the interior. In other words, we may never be able to recover how Lord Willoughby de Broke felt in his home, but we can interpret how it is represented by Zoffany. Other studies have turned to literature in order to recover a historical understanding of the private self, as in, for example, Victoria Rosner’s Modernism and the Architecture of Private Life, where modernist literature is conjoined with the interior “in the creation of am experimental, embodied, and unstructured private life.” For art historians, at least, the exploration of these and other themes has almost exclusively addressed elite homes. What to say about the middle class homes, not to mention the homes of the poor, especially in relation to class, taste, and aesthetic choice? Kate Roach has previously raised this concern in a blog post, and a future post will further probe this question. 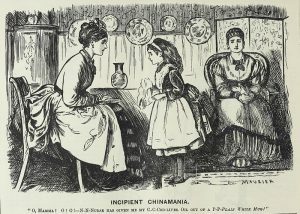 Could it be that such a child existed in the 1870s, as parodied in George du Maurier’s cartoon for Punch, that complained of taking her medicine from a plain mug? *Hamlett notes that these themes have “important implications for the history of women and gender.” We will take up this point in a later post.